‘The worst class ever.’ That was Deirdre Ehlen MacWilliams’ introduction to art history. Her mother, a fashion history professor at Nassau Community College on Long Island, insisted Deirdre take college classes during her summer breaks in high school—pushing art history, in particular. Deirdre wasn’t a fan, but took a similar course by chance during her second semester at GW. Taste—in art, as in life—evolves. Deirdre majored in art history, and moved to New York City after graduation to pursue a Master’s degree in arts administration from the Fashion Institute of Technology. She worked for several galleries in the city, as well as an art consultant. The rest, as they say, is (art) history. 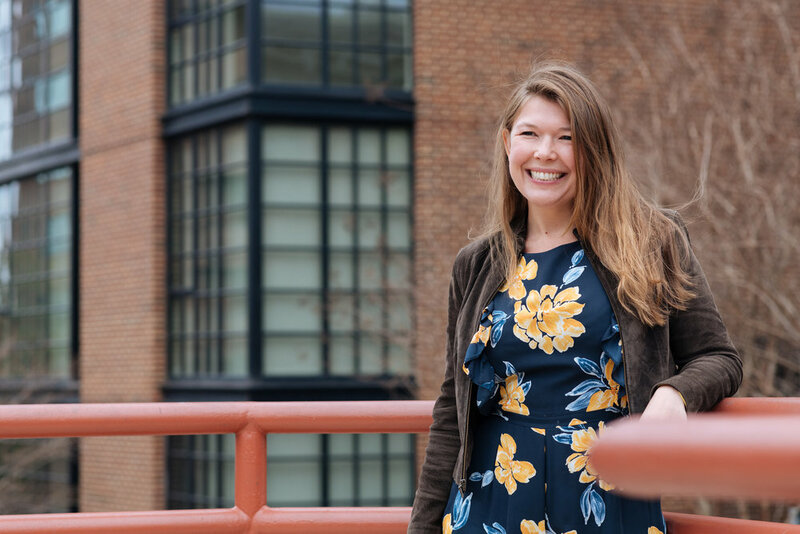 After a year working in an artist’s studio, Deirdre accepted a position as a project manager for the DC Arts and Humanities and began doing curatorial work. Her big break came in 2014, when she curated the 2014 Foggy Bottom Sculpture Biennial. Thanks to her work in Foggy Bottom and as a producer for two iterations of the 5x5 Project, Deirdre was recommended to the Georgetown BID, who was producing its inaugural Georgetown GLOW light art festival in 2014. Five years later, Deirdre remains its curator. The majority of Georgetown GLOW’s light art installations are interactive—encouraging visitors to get up close and personal with the works, all of which are juxtaposed against Georgetown’s historic environs. Although Deidre says it’s impossible to select pieces with universal appeal, she revels in mixed reviews. GLOW presents a unique challenge for Deirdre, who must select pieces that are durable enough to withstand a month of unpredictable weather, potential vandalism, and visitor wear and tear. In addition to her year-round work with Georgetown GLOW, Deirdre is a public art project manager for Arlington Public Art and most recently curated a project called ‘Put the ‘I’ in Civic’ by area artist Linda Hesh. The artwork spells out the word, but the first ‘i’ is missing. At home, Deirdre’s personal art collection elicits its own reactions from her husband—a fellow college rugby player whom she met at a sports bar when they were 18. Now parents to a toddler, Deirdre says they rarely go out anymore—affording her a slightly bigger budget to spend on a few pieces of local art each year. Taste, Deirdre reiterates, is a universal matter of dispute. That’s kind of the point.